﻿For ﻿about ﻿20 ﻿years ﻿I ﻿was ﻿a ﻿keen ﻿track ﻿and ﻿field ﻿athlete. ﻿My ﻿event ﻿was ﻿Heptathlons, ﻿specialising ﻿mainly ﻿in ﻿High ﻿Jump ﻿and ﻿Sprints ﻿(on ﻿days ﻿when ﻿I’m ﻿not ﻿doing ﻿the ﻿normal ﻿7 ﻿events, ﻿that ﻿is). 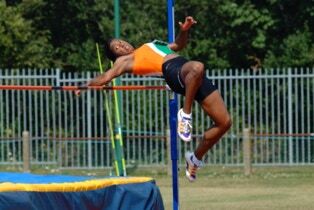 ﻿My ﻿day ﻿job ﻿was ﻿as ﻿a ﻿graphic ﻿designer ﻿and ﻿my ﻿evenings ﻿and ﻿weekends ﻿were ﻿spent ﻿either ﻿doing ﻿intense ﻿athletics ﻿training ﻿or ﻿competing ﻿all ﻿over ﻿the ﻿south ﻿east. ﻿It ﻿was ﻿a ﻿happy ﻿balance ﻿of ﻿creative ﻿work ﻿and ﻿lung-busting ﻿exercise! ﻿In ﻿May ﻿2008 ﻿I ﻿severely ﻿dislocated ﻿my ﻿knee ﻿during ﻿a ﻿hurdles ﻿race. ﻿It ﻿left ﻿me ﻿with ﻿torn ﻿ligaments ﻿and ﻿my ﻿leg ﻿in ﻿a ﻿brace ﻿for ﻿several ﻿months. ﻿That ﻿was ﻿the ﻿end ﻿of ﻿my ﻿athletics. ﻿It ﻿was ﻿sad ﻿news ﻿for ﻿me ﻿because ﻿I ﻿didn’t ﻿know ﻿what ﻿else ﻿to ﻿do ﻿as ﻿athletics ﻿was ﻿my ﻿life. ﻿At ﻿Christmas ﻿of ﻿that ﻿same ﻿year, ﻿my ﻿husband ﻿gave ﻿me ﻿a ﻿‘Learn ﻿How ﻿to ﻿Knit’ ﻿kit ﻿from ﻿John ﻿Arbon ﻿Textiles. ﻿It ﻿contained ﻿yarn, ﻿needles ﻿and ﻿a ﻿‘How-to’ ﻿book, ﻿all ﻿in ﻿a ﻿cute ﻿little ﻿alpaca ﻿woven ﻿bag. ﻿What ﻿started ﻿off ﻿as ﻿a ﻿curious ﻿interest, ﻿quickly ﻿became ﻿an ﻿obsession! ﻿I ﻿pretty ﻿much ﻿started ﻿designing ﻿right ﻿from ﻿the ﻿moment ﻿I ﻿picked ﻿up ﻿my ﻿needles. ﻿This ﻿was ﻿mostly ﻿because ﻿I ﻿couldn’t ﻿understand ﻿knitting ﻿pattern ﻿instructions. ﻿I ﻿looked ﻿through ﻿many ﻿knitting ﻿magazines ﻿- ﻿although ﻿they ﻿did ﻿help ﻿a ﻿bit, ﻿I ﻿still ﻿found ﻿them ﻿baffling! ﻿Not ﻿to ﻿be ﻿beaten, ﻿I ﻿decided ﻿to ﻿re-write ﻿the ﻿instructions ﻿using ﻿short ﻿notes ﻿and ﻿diagrams ﻿instead. ﻿From ﻿then ﻿on, ﻿I ﻿was ﻿designing ﻿and ﻿knitting ﻿my ﻿own ﻿sweaters. ﻿In ﻿those ﻿days, ﻿I ﻿would ﻿buy ﻿the ﻿yarn ﻿first, ﻿then ﻿realise ﻿later ﻿on ﻿that ﻿I ﻿didn’t ﻿buy ﻿quite ﻿enough ﻿(we’ve ﻿all ﻿been ﻿there, ﻿huh?). ﻿This ﻿meant ﻿that ﻿I ﻿would ﻿end ﻿up ﻿designing ﻿my ﻿top ﻿based ﻿on ﻿what ﻿I ﻿had ﻿- ﻿pretty ﻿much ﻿making ﻿it ﻿up ﻿as ﻿I ﻿went ﻿along! ﻿After ﻿honing ﻿my ﻿skills ﻿somewhat, ﻿I ﻿published ﻿my ﻿first ﻿pattern ﻿in ﻿2011. ﻿When ﻿asked ﻿this, ﻿I’ve ﻿heard ﻿other ﻿designers ﻿say ﻿that ﻿they ﻿are ﻿either ﻿inspired ﻿by ﻿nature ﻿or ﻿architecture ﻿etc., ﻿but ﻿for ﻿me, ﻿it’s ﻿mostly ﻿based ﻿on ﻿what ﻿I ﻿actually ﻿want ﻿to ﻿wear! ﻿I ﻿tend ﻿to ﻿look ﻿for ﻿something ﻿unusual ﻿in ﻿a ﻿design, ﻿because ﻿I ﻿have ﻿this ﻿snooty ﻿idea ﻿that ﻿I ﻿do ﻿NOT ﻿want ﻿to ﻿look ﻿like ﻿anyone ﻿else! ﻿I ﻿would ﻿like ﻿people ﻿to ﻿say, ﻿“I ﻿haven’t ﻿seen ﻿that ﻿before!” ﻿- ﻿something ﻿novel, ﻿maybe. ﻿Of ﻿course ﻿not ﻿all ﻿my ﻿designs ﻿are ﻿novel, ﻿but ﻿if ﻿it’s ﻿not ﻿unusual, ﻿then ﻿it’s ﻿exactly ﻿what ﻿I ﻿wanted ﻿to ﻿wear ﻿at ﻿that ﻿moment ﻿- ﻿as ﻿the ﻿mood ﻿takes ﻿me. ﻿I’m ﻿an ﻿impatient ﻿person ﻿(no ﻿surprise, ﻿I ﻿was ﻿a ﻿sprinter ﻿after ﻿all, ﻿can’t ﻿imagine ﻿going ﻿anywhere ﻿slowly! ), ﻿so ﻿I ﻿am ﻿always ﻿mindful ﻿of ﻿how ﻿long ﻿or ﻿complicated ﻿a ﻿knitting ﻿project ﻿can ﻿be. ﻿My ﻿designs ﻿always ﻿take ﻿into ﻿account ﻿the ﻿complexity ﻿of ﻿a ﻿design ﻿and ﻿I ﻿try ﻿to ﻿create ﻿simpler ﻿ways ﻿to ﻿build ﻿it. ﻿My ﻿patterns ﻿use ﻿clear ﻿and ﻿concise ﻿information, ﻿diagrams, ﻿photos ﻿and ﻿even ﻿video ﻿tutorials. ﻿If ﻿a ﻿design ﻿that ﻿I’m ﻿working ﻿on ﻿proves ﻿to ﻿be ﻿a ﻿pain ﻿to ﻿knit, ﻿then ﻿I ﻿reject ﻿it. ﻿I ﻿am ﻿all ﻿for ﻿giving ﻿my ﻿customers ﻿something ﻿that ﻿I ﻿myself ﻿would ﻿be ﻿happy ﻿to ﻿knit ﻿repeatedly, ﻿and ﻿even ﻿customise ﻿freely! ﻿A ﻿big ﻿Thank ﻿You ﻿to ﻿all!